The Translation People does more than just translation. We have the talent, skills and resources to provide interpreting services. We’re also able to offer these services in a wide range of situations and contexts. Our interpreters are comfortable working in anything from a business meeting or conference to training events or court proceedings. If you are looking for an interpreting service that will be an asset to your international event, look no further. Ove the years, we’ve worked with clients from a number of different industries and sectors and provided each of them with carefully managed and highly tailored service their project required. We achieve this mix of quality and flexibility by drawing on our dedicated account managers and our wide network of talented, trusted, and fully-qualified interpreters. Each of our interpreters has at least five years’ experience of professional interpreting and meets all of our rigorous, high standards, allowing us to maintain our position as a market leader. We know that every client has different requirements and needs, and that’s why our interpreting solutions are carefully planned out. 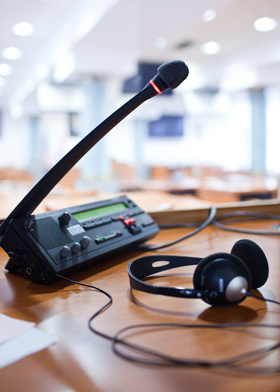 Not only can we provide skilled interpreters, we are also able to provide state of the art equipment, including booths, headphones and microphones, and skilled technicians available on-site for the duration of your event. Consecutive interpreting is ideal for more formal situations where interpreting occurs either after each sentence or short turns of talk. This style of interpreting is commonly used in court proceedings, small conferences and group discussions. Simultaneous interpreting is most often used at large multinational meetings where proceedings are interpreted with a 2-3 second dely. It is a more complex form of interpreting and involves teams of two or three skilled interpreters working in soundproofed booths. Telephone interpreting is consecutive interpreting over the telephone. This can be arranged with an interpreter on speaker-phone, dialing into a conference call or simply by calling the interpreter and passing the phone between parties. Chuchotage or ‘whispered’ interpreting is when an interpreter sits beside one or two delegates at a meeting or conference and whispers the translated language either simultaneously or consecutively.